Adjustable 2x-sided rack handles SUP & surfboards to 150 lbs. 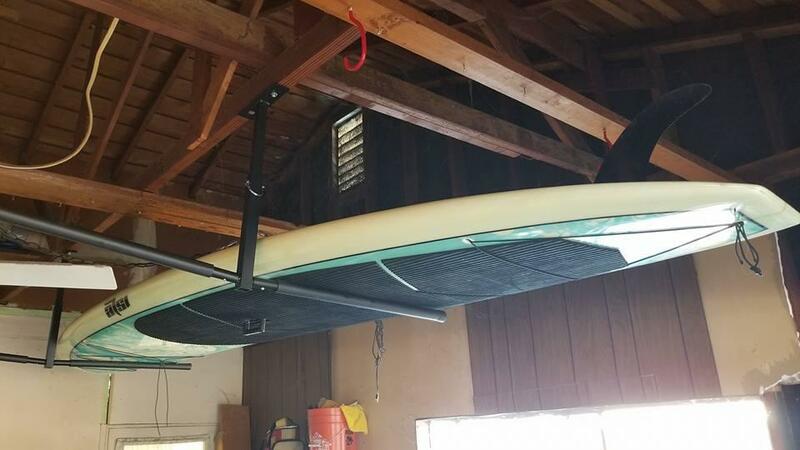 Removable arms for padded support: The removable arms extend from the center post and attach at a slightly upward angle to safely hold your boards. The rack is available in two sizes: The Large arms are 25" long and the XL arms are 30" long to provide more support for your wider SUPs. This allows you to confidently place boards on the arms for solid, sturdy storage. 150 lb. capacity for large collections: Store up to 75 lbs. per side, plenty of support for your standard kayaks and enough to allow SUPs to be stacked. Stackable board setup: Drop the center post to full extension and you'll have 18" of height between ceiling and arms; plenty of room to stack multiple boards. Each of the 2 posts is individually mounted so board length won't be an issue, whether you have a 7' surfboard or 15' SUP. 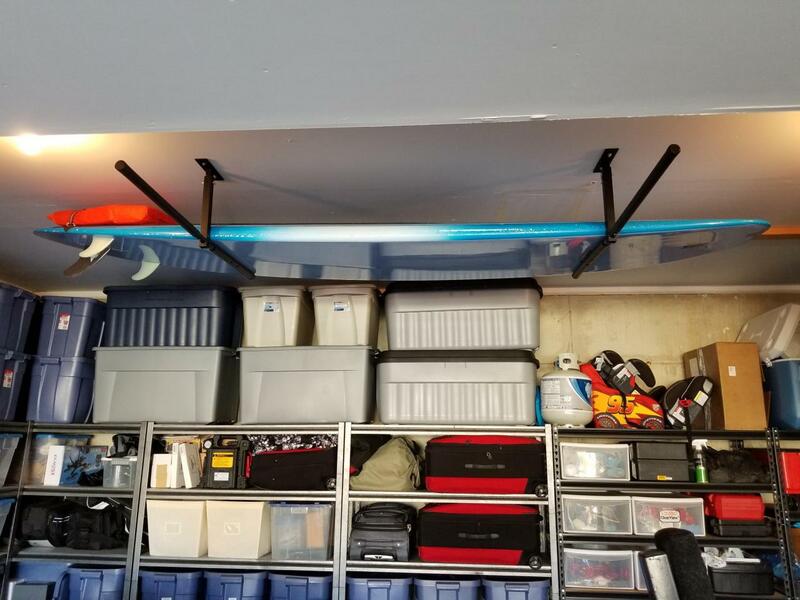 Extension/retraction post minimizes space used: The center post can drop down to maximize storage (18" board/boat space from ceiling), or retract (10" board/boat space from ceiling) to allow for greater clearance beneath the rack. Mounting holes at approximately 1" intervals allow for your optimal setup. "Low bridge" clearance (maybe you want to park a car beneath the rack?) is approximately 12" below the ceiling. 90 degree mounting rotation to use on any ceiling: This is a big one since kayaks and boards can be very long and garages have joists that only run in one direction. The Hi-Port 2 opens up new possibilities by allowing you to mount the rack with arms running either parallel or perpendicular to the ceiling rafters. Removable, padded arms: If only using one side, allows the post to be mounted against a wall. NEW (2019) upgraded hardware: Listening to customer feedback, we've upgraded our hardware to heavy duty screws that install easier. 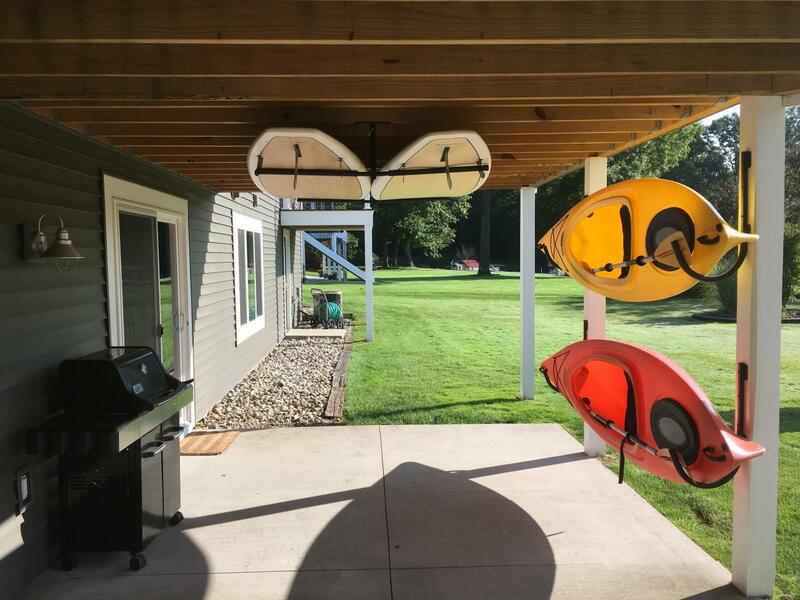 Suitable for outdoor use: Coated steel components will hold up against the elements, so go ahead and mount under a deck or boathouse. "No slip" padding: Full length arm padding won't slip or roll, but will grip your boards or kayaks. Gated pins prevent accidental movement: Post pins lock in place with an integrated gate to fully secure the posts. Maximum board/kayak height = 18"
Large arm width = 25"
XL arm width = 30"
Total rack width, Large = 52"
Total rack width, XL = 62"
Full length from ceiling = 12" - 20"
Hey! This is Josh from StoreYourBoard, here today with the Hi Port 2, a double ceiling rack. Right here, I have it alone in front of me. It’s basically two pieces that can slide up and down, and then you have the arms on either side to hold your boards and your kayaks. It fits together like this, so that’s it’s most compact. It hangs down from the ceiling about a foot, and you have about 10 inches of storage. If you want to keep it nice and tight to your ceiling, you use that. You put your stuff, your surfboard nice and tight and drag your car into your garage or whatever you need, you have plenty of room. If you have a bigger kayak, you want to stack a couple of boards, you can go ahead and extend it out. You can get up to 18 inches here of storage and it hangs down about 20 inches. Then there are holes all in between, so you also include a locking pin. You just wind it up, put it through, and you latch it to be secure. Like I said, it’s a double-ceiling rack, so it comes out either. I’ll show you another board here in a second. It comes out to your side, but the arms are like this, nice seal padded arms. They simply attach, push the button, and you’re in. You’re locked in. If you want to use one side, you can use one side. You can use two; you put both on. If you’re not using it in the offseason, you can take both off. It gives you a lot of flexibility. The other really cool thing about this is because the way ceiling joists are, some run this way and some run this way, the way we designed this is this, and turn it either this way and your board is this way, or you can go 90 degrees like that and then you can orient with the joist, the stud, and the screws into the joist, and then the boards can be whichever direction you need. I’ll show you here, the arms fit on just like this. 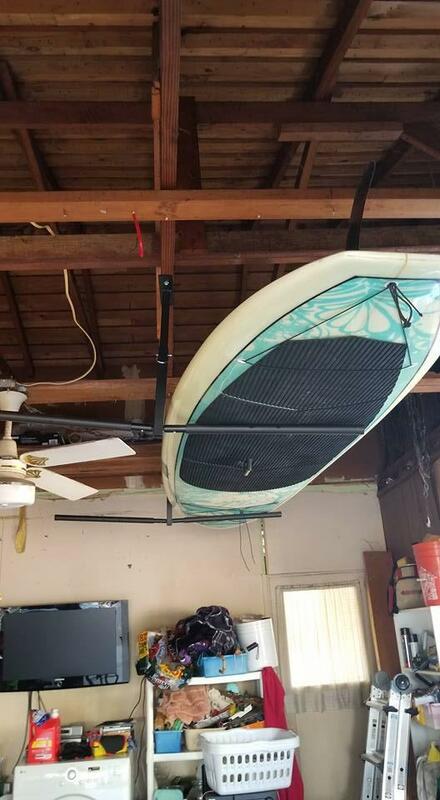 Hi-Port 2 is great for all types of boards and kayaks, so the kayak here, I’m going to put a surfboard up. We recommend about 36 inches is the maximum width, and then because these are independent, you can basically go however long you want, so if you have a really long touring board, touring kayak, 18 feet, that should be fine. You just mound these farther apart. 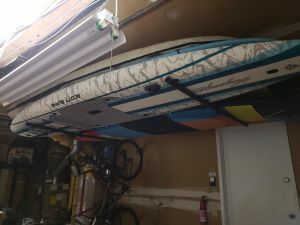 One of the key dimensions, this is a 25-inch arm, but you can hang it out a little bit more, so you get basically a 36-inch wide standup paddleboard, kayak, whatever you need. We also have a maximum 100-pound weight rating on this, so between whatever you’re putting up here, keep it at 100 pounds or below. I’m going to go ahead and put a standup paddleboard on now. You just slide it right up like that, so you can walk below. You got great overhead storage. 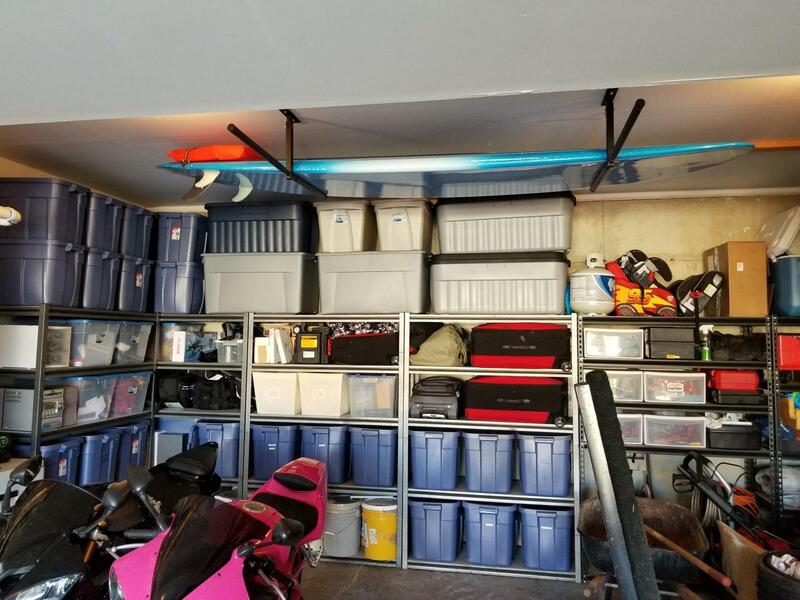 If there’s often underused storage area of your house, your garage, put your boards, put your kayaks on your ceiling and get your house organized. Go check it out at StoreYourBoard.com. Can two or three sets of racks be "stacked" one below the other to add more capacity? In other words, do the perpendicular posts allow for an interconnection to another rack below it? The posts on these Hi-Port Adjustable Board Rack cannot be combined to expand the system at this time. 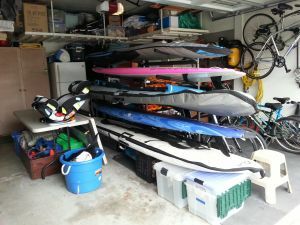 But you can store up to 50 lbs on each side (up to 100 lbs total), as well as lower or raise the height of the rack to allow more room, so that it is possible to store a couple of boards on one side if that helps (up to the weight max, and if you are okay stacking boards). Is it strong enough to store one 100 pound Kayak on one side alone? 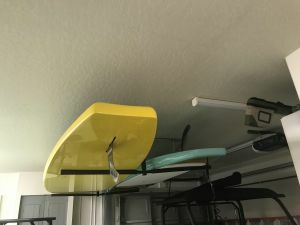 We would not recommend storing more than 75 lbs per side on this ceiling rack; while the system can support up to 150 lbs if mounted properly, the weight needs to be evenly distributed between the sides, with no more than 75 lbs on either arm. If you are just storing the one kayak that is over 75 lbs, we still wouldn't recommend it, as it would be too much weight on that side. 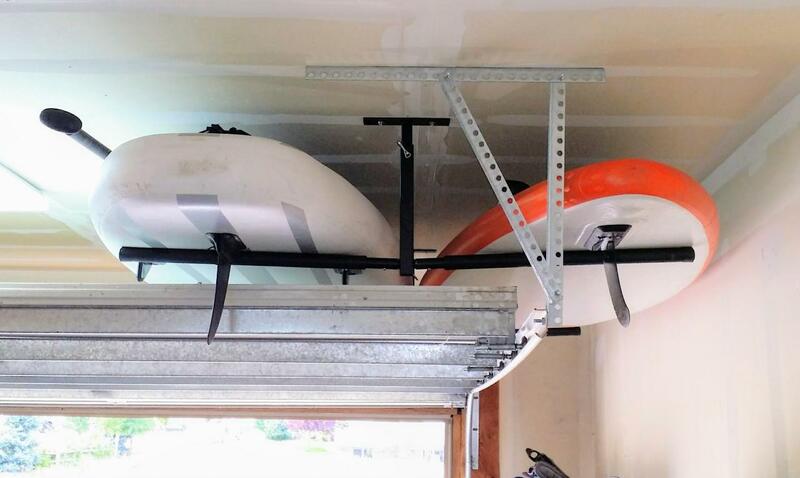 Our garage ceilings are ~10.5 feet tall, will this rack hang low enough to comfortably store two paddle boards? I'm worried the rack won't move low enough to easily place the boards on the rack. Would you recommend getting the pro ceiling hoist instead? 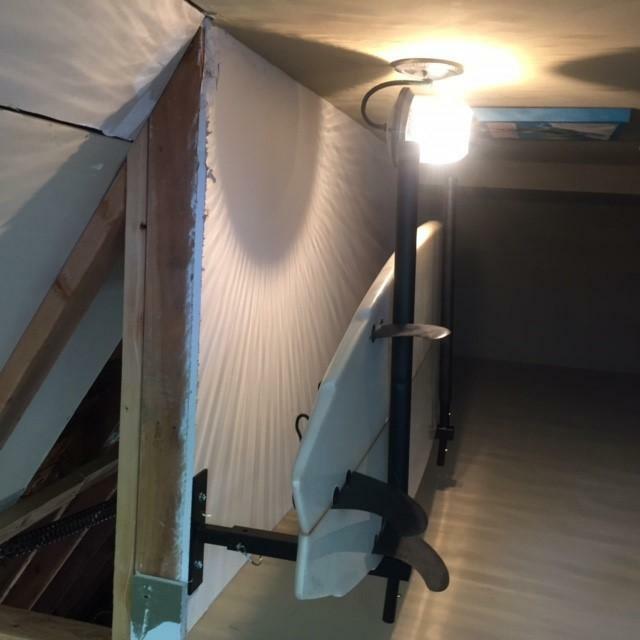 The lowest from the ceiling the Hi-Port 2 can hang is 20", so a little less than 2 feet from your ceiling. That means the lowest it will be is about a tiny bit less than 9 feet tall.... so that could be difficult to place a board...so, yes, you may want to look at a hoist such as the Hi-Lift Pro, that will hoist boards in ceilings up to 12 feet tall. 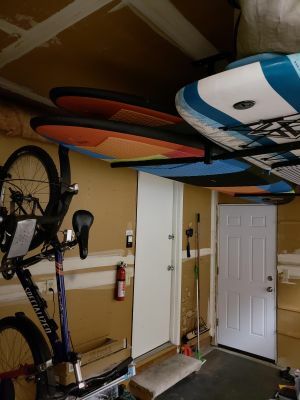 Is there anyway to lock a paddleboard on this storage unit? I will be using this to store it under a home on stilts. The locking solution we would recommend for use with the Hi-Port 2 would be dock locks, seen here: https://www.storeyourboard.com/sup-lock-system-dock-locks/. It is a very versatile locking system; the base system includes one locking cable, and one "jaw clamp" that you use to attach a SUP to the locking cable; you can then also purchase additional "jaw clamps" to secure additional boards to that same cable. It basically will secure the boards to a stationary object, and it also works for surfboards. The quality of this product is great! Sturdy and super easy to install. Simple clean design and minimal effort to install. 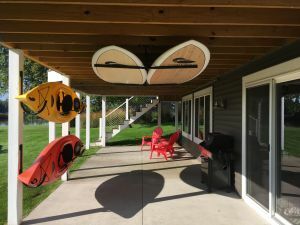 It was easy to install and two large paddle boards with ease. I would highly recommend this storage solution. Simple and functional design, easy to install, exactly what we needed. Thanks ! The Hi-Port 2 is exactly as advertised. We are impressed with the quality of the product, the ease of installation and use. It is clean looking and an excellent way in which to store, or display, your surfboards and skis! Was looking for something that would keep two board up and out of the way in a screened-in back porch. I mounted the brackets to exposed beams, snapped on the legs and walla! Worked perfectly. It maybe took me 30 min. start to finish and could do it all solo. A great solution for the money. Simple Storage Solution and Easy Installation! My husband mounted this in minutes and our SUPs and surfboards were finally out of the way! I have limited wall space but plenty of ceiling space in the garage. This fits perfectly and takes up no floor space. I like how the unit mounts to the ceiling in either direction to allow mounting to the rafters. Feels very sturdy. So easy to get my daughter's paddleboard up there that now I want to put a kayak on the other side for myself. The racks were very nice quality and super easy to install. I would highly recommended this product to anyone! We are very pleased with product. Easy install, stores two boards completely up and out of the way. Beautiful design, well built. Seriously, I couldn't be happier with this storage solution. 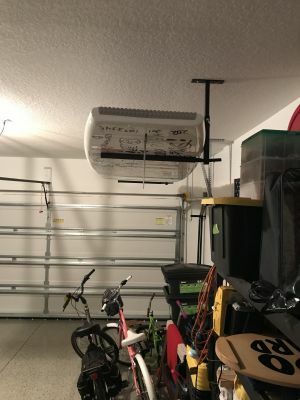 I'm 6'4", and can walk under them with room, where I installed this in my garage. You will not be disappointed with this purchase. Loved the product - very useful and easy to set up. Only issue is that one of the screws came damaged so had to go out and get another. Thanks again for an excellent product! Easy to install, and is great in the garage. Easy to assemble, and holds my 4 long boards and my fish. Written by: Michael j N.
Quality = 10 . Heavy Duty = 10 . Shipped out right away / delivery = 10 . THANKS = VERY GOOD PRODUCT. No problem on recommending this product for anyone ! 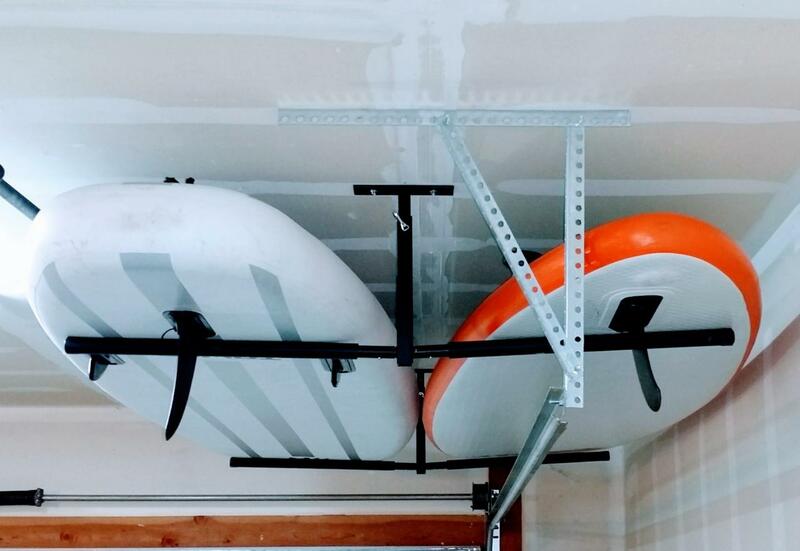 We used this rack to store our paddle boards directly from beams beneath our deck. It keeps them out of the way and we love how it is adjustable in height and width spacing. Adaptable for all needs. StoreYourBoard was so great to work with. Never purchased from them before. When our first unit arrived damaged, they quickly sent us another one to replace it. Would highly recommend doing business with them. Great product--easy to install (per the handyman). Holds our larger board (12'6 X 31-1/2 X 5-13/16). Great product. It's a little too high for my wife to use, but maybe my garage ceiling is unusually high. This is just what we needed for two boards in our new home. Installation was simple and the product had excellent build quality. Thank you! Thanks for the ceiling board rack. Well made product that took minutes to install. Really like the adjustment in height and mounting plate orientation. I would definitely recommend this rack. Excellent quality. Solved my storage issue perfectly. Recommended. Great product and east to install (once you find the studs). Easily hold my 2 new Paddleboards! Will probably buy another one for new Kayaks I will be getting! I just hung it up over the weekend. It worked great and was as easy as could be to install. I would definitely recommend this to a friend! Love the product, design and concept! I purchased two Hi-port’s as I just use one side. 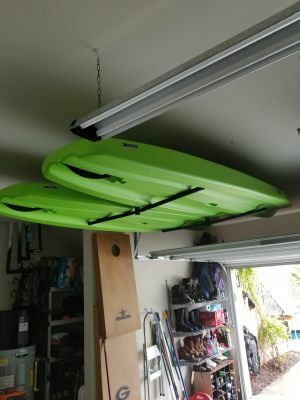 My SUPs are heavy so I chose to use larger bolts to hang the Hi-ports. The packaged bolts, which probably work awesome, appeared to be a little small for the weight on the system. Very high quality and adjustable ceiling storage rack. For the price, surprisingly very well built and easily holds 33” wide sup. Recommend placing a 1/4” wood spacer between drywall and rack using 3” deck screws. Everything went perfect... from the purchase, price, communication, delivery, and the installation was a breeze. I would HIGHLY recommend this company! So impressed with the first hi port 2 that stores my boards outside.... I ordered a second for winter garage storage. You can't beat this deal. Easy to install, secure and easy to use. Love the ease of taking apart as well. I installed this in about an hour tonight. Most of the time was spent finding the studs and measuring the distance away from the wall that I wanted to install it. Honestly the hardest part was getting my boards up there after I was finished :) it's nice to have the extra space in my garage with my paddle boards up out of the way. Very nice product. Detailed instructions with pictures or illustrations would have been more helpful, but that is really my only suggestion. The Hi-Port 2 offers excellent flexibility in a sturdy product. The height adjustment is a perfect compliment to Hi-Port 1 Storage Mount, as it can be positioned above or below that rack. 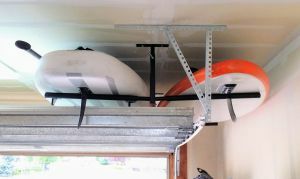 I installed the rack over the utility sink in the garage, so it is a great place to hang wetsuits, as well. Easy install, durable material. Installed in my garage and easily holds 4 boards. I purchased the board rack about a month ago. it was on backorder so i didnt received it until a couple weeks ago. I thought the instructions were extremely easy to follow and the product as very easy to install. I ended up installing it in a doorway inside my garage area. I was limited with the amount of space I had so I was only able to use one leg of the rack. It worked exactly as I wanted though and I am comfortable storing two boards in my garage. I shared some pics of the installation. Product is well made with amply height and position adjustments. Installation was relatively simple with 4 anchor bolts. 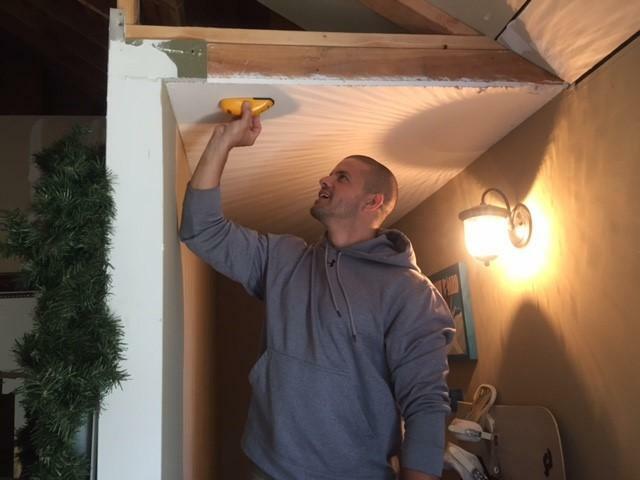 Finding studs in ceiling behind drywall was my biggest challenge as my joists run in different directions in the ceiling area I was using. One thing I didn't notice was that the outer post has two position choices.....90 degrees apart. Had I looked the hardware over I would have noticed (instructions state this following the last install note). In hindsight, I would have mounted my supports along the same joist had I noticed this first. I like that the support arms are protected with a tight foam. Also the multi height adjustment is a good feature. All in all this is a great piece of hardware! I wish to say that my Hi-port 2 surfboard racks are everything that Store your board advertise. 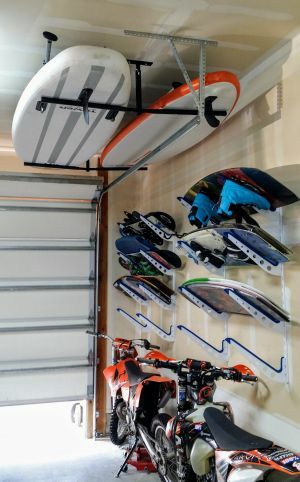 They are amazing I have up to 20 surfboards to store and I have researched many of the storage rack systems out there and I found that the storage rack systems that Store your board have are THE BEST! Not only am I so very pleased with my Store your board racks but I am extremely pleased with the fast delivery of my racks and specially the AMAZING customer service that Bre and the folks provided me throughout my purchase and delivery process. 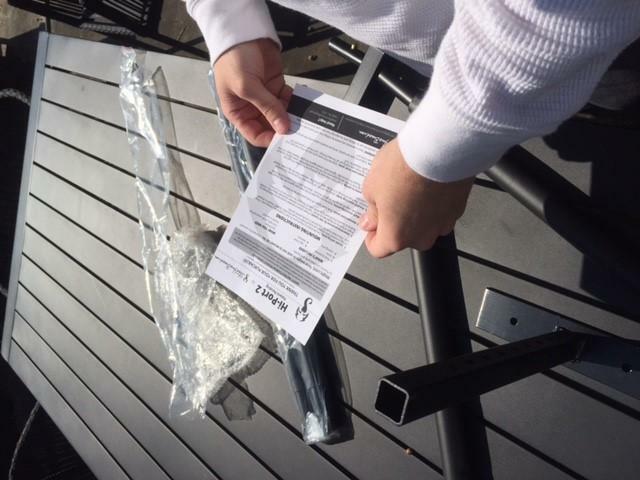 When my 4 sets of Hi-Port 2 racks arrived the packaging that they arrived in was heavily damaged. Obviously this was from UPS who was the delivery company. I took photos of the damaged packaging and called Store your boards let them know that when I did open up my boxes two out of four of my new racks were damaged and missing parts. I sent the photos to them and by the next morning as they said I was contacted by Bre even though this was not the fault of Store your boards they took full responsibility and she said that they would send me out 2 new racks at NO cost to me to replace the damaged and missing items. I received the new racks within a few days. I have now installed all my new Hi-Port 2 rack systems and am Extremely happy with them. As you can see from my attached photos they are perfect for me. 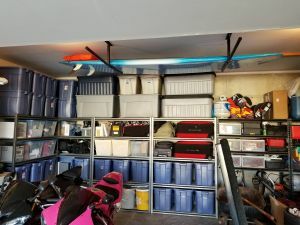 I have three racks in one garage and the fourth in my third car garage. 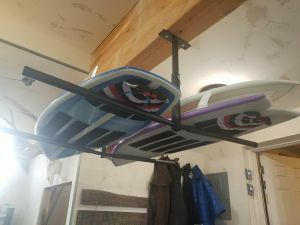 I am able to store one to three surfboards on each side of the racks. staying within their 150LB limits and with their adjustable center posts I can set the racks to my desired distance from the ceiling. Store Your Board showed me as a customer everything that a company should for their customers with FRIENDLY AND RESPONSIVE Customer service. I am a customer for life! I have already been boasting about Store your boards to all of my friends for their SUP and Surfboard storage needs. Thanks Bre and John and all the Store your board team for taking care of me like a family member. Garage storage space in my home is at a premium. Th Hi-Port 2 was the perfect solution. 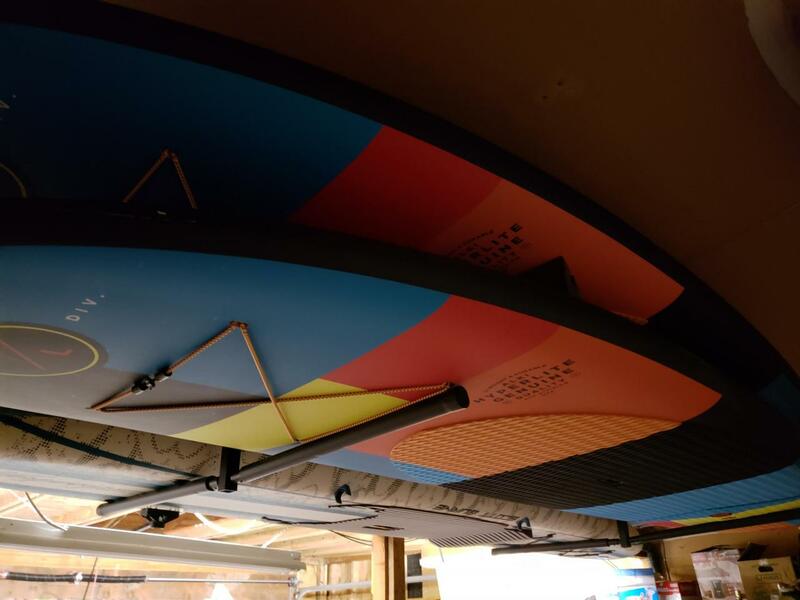 It assembles with ease and holds my 10 and 12 foot paddle boards with no problem! The metal parts have a substantial solid feel even though they are not bulky. It is easy to load and unload the boards. Overall, a good purchase! 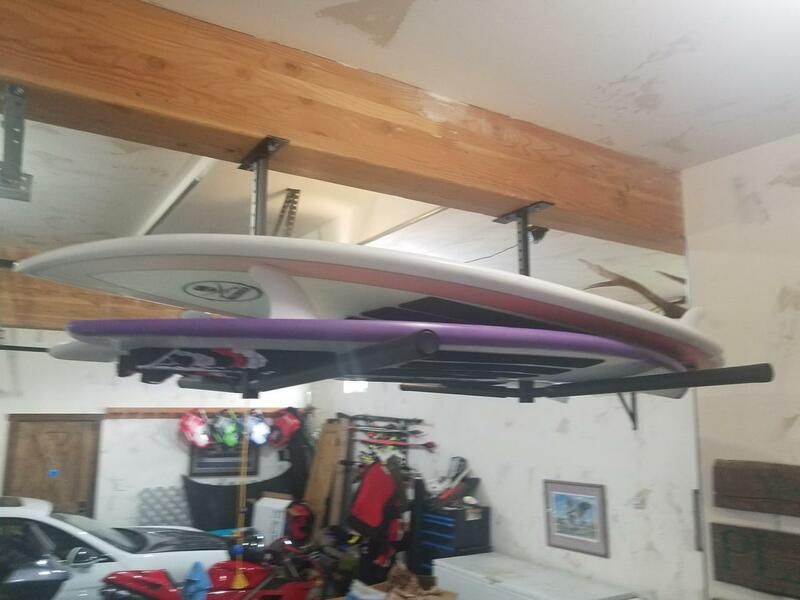 I recently installed my adjustable storage rack for my SUP board and couldn't be happier with the product. It was quick to install and offers plenty of storage options. I'll be able to store my surf boards and wake boards on it as well, and keep everything out of the way during the off season. Great addition to your existing racks! I already use and love the the Hi-Port 1 and Naked Surf racks, but really like the adjustability of the High-Port 2. Easy to install and is currently storing a 12' paddle board, 8' 6' and 9' long boards and a 6' 2" short board. Great capacity with multiple size boards! The unit is extremely easy to mount and the adjust-ability is a nice feature. It not only stores your boards, but your paddles too. Either lay them on top of the board or get a couple of velcro straps and hang them from the bottom. This is my second purchase from StoreYourBoard. In addition to the Hi-Port 2 I also have a free-standing rack that holds 5 boards. The Hi-Port 2 is superbly built, much sturdier than I expected. It was also a breeze to install. Note that you don't have to use it just for boards. I also stuck a large ladder on one side and boards on the other. I highly recommend this product. I will post photos of both of my racks. The Hi-Port 2 seems as functional as it is reliable. We were able to fit our surf boards on there, as well as our fishing poles and we were able to hang our bike surf racks on it as well. The finish on the Hi-Port 2 looks nice as well. The structure seems sturdy enough to support multiple surfboards and/or our paddle boards as well. The rack was easy to set up and the rack arms seem to be easily removable, if necessary. Our only complaint is that our ceiling is too high and the rack does not go low enough for my wife to reach the boards. Other than that, we are thrilled to have our surfboards and paddle boards safely off the floor of our storage room, creating more space for more toys! Excellent product: solidly built, easy installation. It allowed me to store both the kayak and the SUP in one location and close enough to the garage ceiling so as not to be in the way. Hi Port 2 is a life saver! 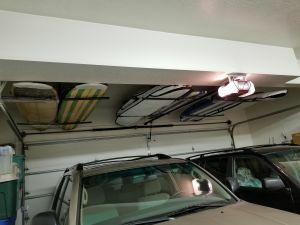 The Hi Port 2 was easy to install and helped to clear up my garage by getting some of our bigger surfboards off the floor. Finding the studs in the garage ceiling was fairly easy, and then just four screws are needed to mount the rack. Simple and easy, I'll probably buy another one. 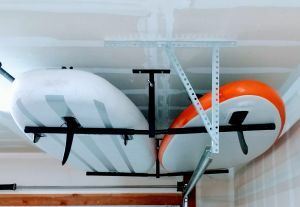 Overall, this is a great, functional rack that makes storing boards pretty efficient. Installation is relatively easy and flexible. The rack itself is built like a tank - solid hardware all around. Padding is fine where needed for our purposes... The foam seems dense enough to last and soft enough to offer protection for our fiberglass and foam surfboards. This rack is working well in our basement. The only negatives I can think of are nit-picks: It's built from steel, so it's a little bit heavy. it's not the most "refined" aesthetically if you want to use it for display. From a value point of view, I don't think this can be beat. It's adjustable, so you can easily fit several boards on each side or accommodate low ceilings if necessary. Very happy with it. It took me roughly 45 min to install. Pretty easy. I snapped 1 bolt trying to ratchet it up tight. Just had to pre-drill larger holes.Keeps my board up and out of the way. 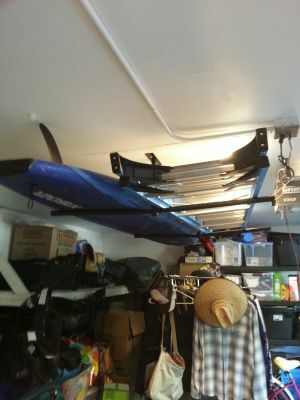 This Hi-Port 2 rack fit the area perfectly where i need to store a couple inflatable SUP's. I wanted to get my SUP's from taking up space on the garage floor along with making the floor much easier to sweep or pressure wash. I have space above my garage door and to the side of the ceiling light. My ceiling height is 11' and the garage doors are 9'. 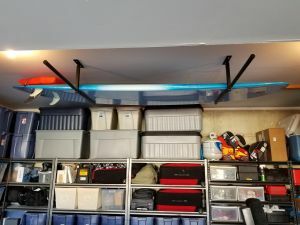 With the adjustable height and gated pin, I was able to quickly adjust the rack depth to get the maximum usable space above the garage door. The included instructions are thorough, even though to most people will find the installation to be quite self explanatory. All mounting hardware is included. I just used a 10mm socket with ratchet, drill with 3/16" bit, tape measure, and a ladder. The installation was very simple and took about 10 minutes. I spaced the racks so I would get at least 1' overhang on each end of the SUP's, as recommended. The whole process from unpackaging the rack until the boards were in place took less than 30 minutes. The rack is very sturdy with very little play in the adjustable parts. The padded arms keep your boards from getting damaged, yet are smooth enough to allow them to slide in and out of place easily. The padded arms have a push button sliding pin, so they stay in place firmly, but can also be easily removed. This comes in handy as the area where I chose to installed my rack has interference on the inside mounting position with any boards over 10', due to the the garage door track and and end mounting bracket. 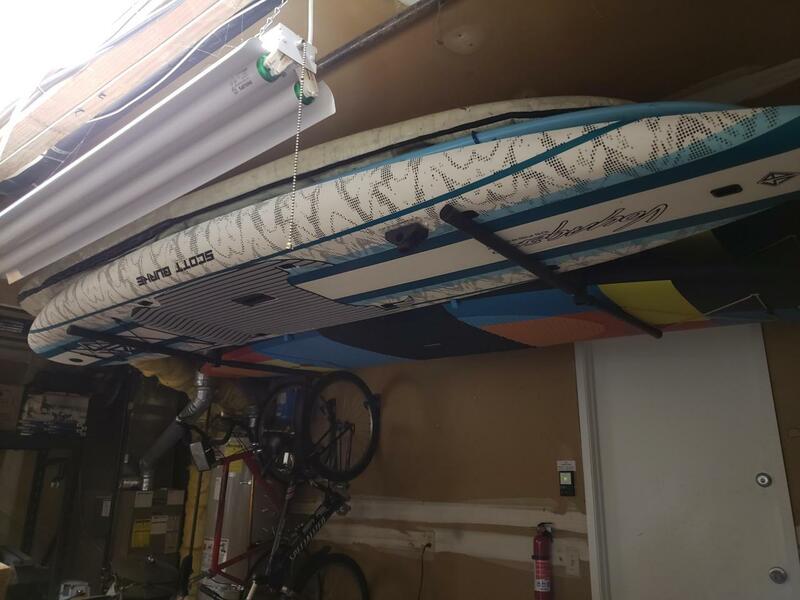 As I have a 10'4"x32" and 9'x30"Inflatable SUP, the inside position fits the 9' board fine, but if i wanted to place a 10'4 board there, i can just remove one of the arms, lift the board into place and reattach the arm quickly. 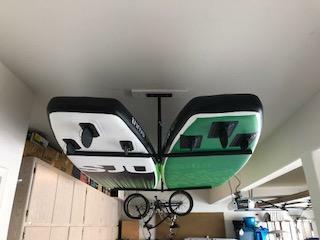 The Hi-Port 2 rack was exactly what i was looking for to store my inflatable SUP's during the season, as I don't want to inflate and deflate them all the time. I am very happy with this product and would recommend. 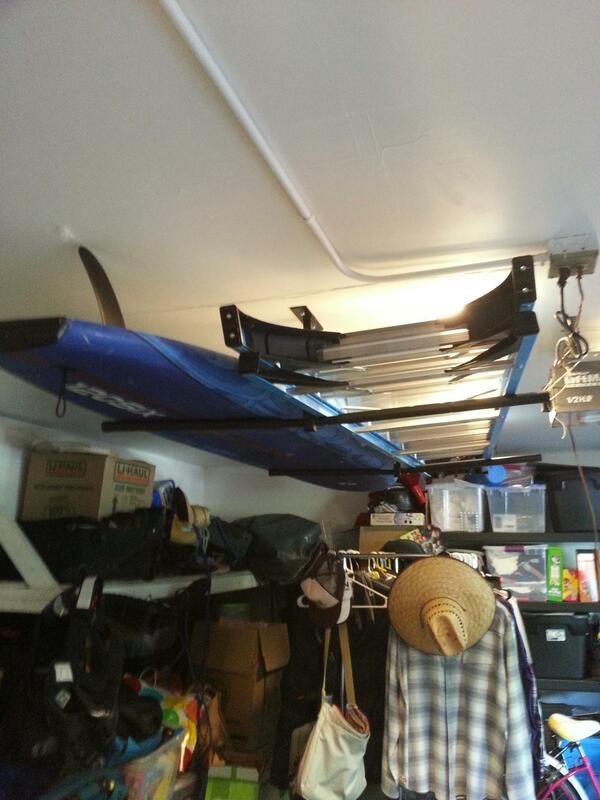 *Note also SYB's Wakeboard Storage Rack below the Hi-Port 2 in the photo. 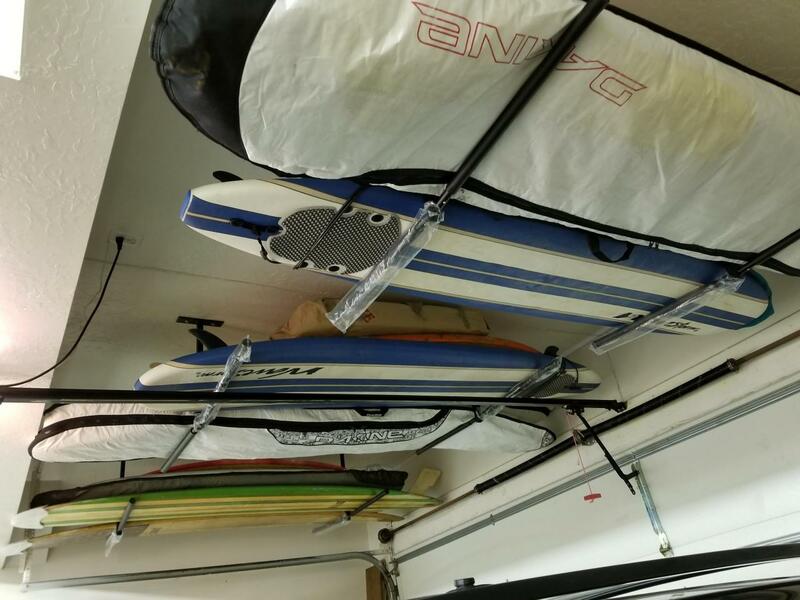 I store my kiteboards, wakeboards, surfboard on them - love these things too! Hello. Though I had wall racks already I wanted space back so our garage had turned into gym for basketball playing son. These racks surprisingly saved the day. I was worried because my garage ceiling is on slant but the racks worked perfect for my two 10'6 paddle boards. Truly happy on product. shipped fast, product was well packaged. Install was simple and the rack is very strong and sturdy. We have had our boards for about a year and really enjoy using them. What we didn't particularly enjoy is where to store them. No matter where we put them they were pretty much a pain. Enter the Hi-Port 2 ceiling storage rack. Installation is both simple and elegant. Took the two of us less than half an hour following the clear and simple instructions that come in the box. 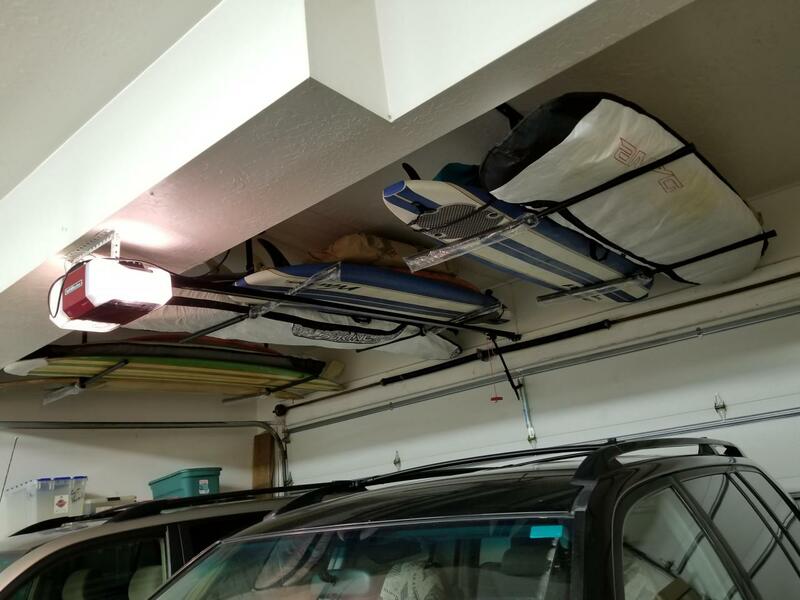 Sweetness, light, and space abound after simply storing the boards in that unused space between your garage door and the ceiling! Great system with excellent end results. 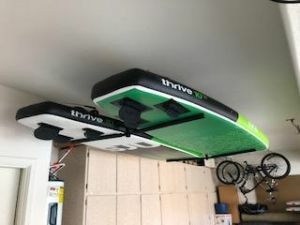 I have 2 Naked SUP racks that I absolutely love for ease of access and simplicity, but I've been looking for a better option for my kayak and winter storage of the sups, I saw this product and knew it fit what I was looking for. Great for the kayak and great for winter storing the sups. 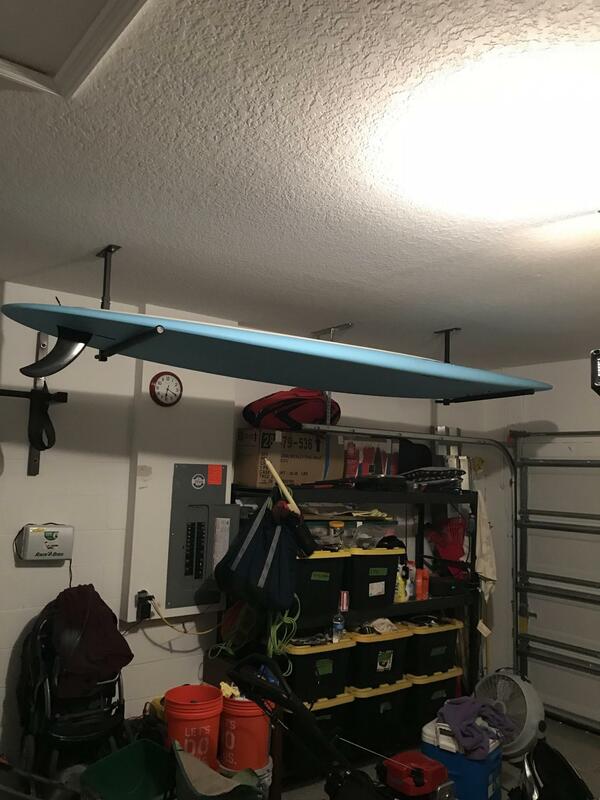 My garage ceiling is a little too high to make it easy to put the sups on and off by myself, but I could see it working great on a lower ceiling. Easy install, took about 20 minutes start to finish. This rack is an amazing upgrade from the previous rack I used to store my SUP. Extremely easy to install, use, great quality and flexibility is the best feature. Would buy more if I needed them.